The epic hero has fallen to the wayside. Sure, movies like Gladiator, 300, Avatar and Troy still tell tales of men and women embarking on a mission to go save the world for the better. These days, they mostly head out into our far distant past or an alternative dimension—there seems little room for an epic hero right here in the 21st century. Perhaps, in our own complicated time, we simply can’t find it realistic for a person to embark on a grand adventure and change the world. Or at least, if it happens, we’re not reading about it in our fiction. Pádraig Mac Carron and Ralph Kenna, mathematicians and the authors of The Universal Properties of Mythical Networks, reason that the networks of social interaction in classic epics more accurately represent how we socialize on a day-to-day basis in 2012 than in most of today’s modern fiction. Social media give individuals the power to interact in familiar ways with an unprecedented number of people all over the world. If we communicate with more people than ever before, do heroes like Odysseus have any room now to surprise us, to make a comeback? 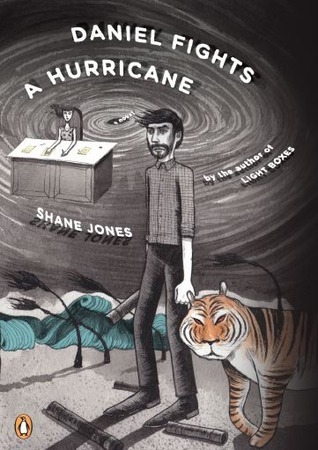 We could easily dismiss Daniel Suppleton, protagonist of Shane Jones’ latest book, Daniel Fights A Hurricane, as crazy. He hallucinates that a hurricane bears down to tear the world as he knows it apart. This kind of paranoia has haunted him since childhood, both metaphorically and physically; a dark, heavy cloud constantly broods on the periphery of his life, hovering at the edge of the horizon. As Hurricane starts, Daniel gives himself over to his own delusion. He abandons his wife and lifestyle for the forest to face the Hurricane, mano a mano. He invents an entirely new world around him filled with men and women who possess capabilities, hindrances and names much stranger than his own. They share his fear, and they aid him. We’re made to understand that, in its way, Daniel’s retreat from reality is an act of bravery. In the context of his own fantasy, he becomes a hero. In Daniel’s former life, Karen, his estranged wife, deals with her husband’s deteriorating mind. She plays roles Daniel needs her to fill and humors his delusions, going so far as to let Daniel call and make appointments when he mistakes her for his therapist. She understands those moments when he needs to leave home, at first disappearing for a few hours, then days, then weeks at a time. Like Penelope holding her ground in Ithaca, bravery and grief give her heroic status. Carefully as a watchmaker, Jones assembles the distanced spouses’ narratives. He pieces together sections of their stories delicately, weaving in and out of times and settings. Among the segments, a third implicit narrative—truth—slowly reveals itself. The guts of the story lie here. Readers should not approach this work expecting a passive read for the weary of heart. Jones rarely gives us work like that. His first novel, Light Boxes, also threaded between different planes of existence, and Jones moved with equal agility among them. Here, though, with Daniel’s and Karen’s realms so completely distinct from one another, we have contrast unprecedented in Jones’ previous work. Jones paints a beautiful place. Tigers hide in trees. Elephants block pipelines. Women sleep in pipes decorated with origami animals, the sleeping places filled with notes written to lost loved ones. We come to know Daniel’s allies purely by their descriptions, as they sometimes have no names at all. We meet The Two-Second Dreamer, a creature that gives two-second dreams to people who need them. We meet The World’s Most Beautiful Man with the Worst Teeth, The Man with Tattoos and Canoe Woman Number Two. Such names add to the mythical quality of the characters and book. The author depicts Daniel’s closest companion, Iamso, as sometimes a boy, sometimes a man. Iamso possesses, like a muse, a gift for writing poems for other people that sum up what they feel. In an interview at HTML Giant, Jones stated that he came up with Iamso’s name by combining the first three words of the book’s original title, I Am So Magical Realism, into a single name. The book took a new form from that point. So where is the truth? Karen’s world? Daniel’s retreat? Somewhere in between? Jones constantly shifts a reader’s focus, renaming characters, leaping back and forth between worlds, between times. Not much remains stable, but at this novel’s root we have The Hero’s Journey. Daniel embarks on journey to face his fears and find his wife. In the process, he brings great change to the world of his invention. And heroically Karen fights her own battle to recover the man she married, the man she loves. Unhinged or sane, grieving or resolute, the Suppletons represent a kind of hero seldom seen in today’s texts. Laura Straub is a contributor at Vouchedbooks.com and the Vicereine of Vouched Books Atlanta. Her work may also be read at Purge Atlanta, Scene Missing Magazine, and Loose Change Magazine.